Alexander Sandy Turnbull was born in Hurlford, near Kilmarnock in Scotland, in 1884. He came from a colliery village and played local football before Tom Maley, the manager of Manchester City, persuaded him to move to Manchester. Turnbull joined a talented team that included Billy Meredith, Herbert Burgess, Sandy Turnbull and Jimmy Bannister. In the 1903-04 season Manchester City finished in second place in the First Division. They also had a good FA Cup run defeating Sunderland (3-2), Arsenal (2-0), Middlesbrough (3-1) and Sheffield Wednesday (3-0). 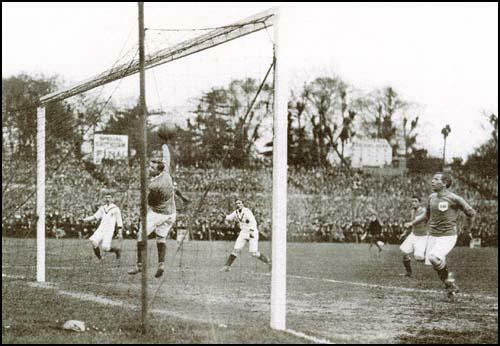 Manchester City played Bolton Wanderers in the final at Crystal Palace. The only goal of the game was scored by the great Billy Meredith. Turnbull, who played at inside-left, had won a cup-winning medal. The Football Association was amazed by Manchester City rapid improvement and that summer they decided to carry out an investigation into the way the club was being run. However, the officials only discovered some minor irregularities and no case was brought against the club. The following season Manchester City again challenged for the championship. City needed to beat Aston Villa on the final day of the season. Turnbull gave Alec Leake, the Villa captain, a torrid time during the game. Leake threw some mud at him and he responded with a two-fingered gesture. Leake then punched Turnbull. According to some journalists, at the end of the game, Turnbull was dragged into the Villa dressing-room and beaten-up. Villa won the game 3-1 and Manchester City finished third, two points behind Newcastle United. The Football Association was now forced to carry out another investigation into the financial activities of Manchester City. They discovered that City had been making additional payments to all their players. Tom Maley was suspended from football for life. Seventeen players, including Turnbull, were fined and suspended until January 1907. Manchester City was forced to sell their best players and at an auction at the Queen's Hotel in Manchester, the manager, Ernest Mangnal signed Sandy Turnbull. In three years at the club he had scored 53 goals in 110 games. Mangnal also purchased Billy Meredith, Herbert Burgess, and Jimmy Bannister from City. These new players did not make their debuts until the 1st January 1907. Manchester United beat Aston Villa 1-0. The only goal of the game was scored by Sandy Turnbull from a Billy Meredith cross. United only lost four games during the remainder of the season and climbed to an eighth-place finish. Turnbull scored six goals in only 15 matches. In April 1907 Thomas Blackstock, a colleague at Manchester United, collapsed after heading a ball during a reserve game against St. Helens. 25 year old Blackstock died soon afterwards. An inquest into his death returned a verdict of "Natural Causes" and once again a football player's family received no compensation. Turnbull was appalled by the way Blackstock's family was treated and joined up with colleagues, Billy Meredith, Charlie Sagar, Herbert Burgess and Charlie Roberts to form a new Players' Union. Herbert Broomfield was appointed as the new secretary of the Association Football Players Union (AFPU). It was decided to charge an entrance fee of 5s plus subs of 6d a week. Billy Meredith chaired meetings in London and Nottingham and within a few weeks the majority of players in the Football League had joined the union. 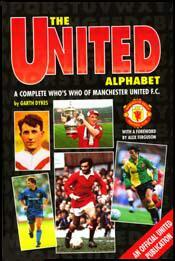 Manchester United started off the 1907-08 season with three straight wins. They were then beaten 2-1 by Middlesbrough. However, this was followed by another ten wins and United quickly built up a good advantage over the rest of the First Division. Although Liverpool beat them 7-4 on 25th March, 1908, Manchester United went on to win the title by nine points. Sandy Turnbull was top scorer with 25 goals in 30 league games. Jimmy Turnbull (5), Harold Halse (4) and Sandy Turnbull (3) got the goals during the successful cup run that got them to the final at Crystal Palace against Bristol City. The game was disappointing and Sandy Turnbull scored the only goal in the 22nd minute. 1909 FA Cup Final at Crystal Palace. Manchester United won their game 5-1. Charlie Roberts told the Manchester Saturday Post what happened next: "At the end of the game our supporters rushed across the ground in front of the stand to wait for the final news from Liverpool. Suddenly a tremendous cheer rent the air and was renewed again and again and we knew we were the champions once again." Aston Villa had been beaten 3-1 and Manchester United had won their second championship in four years. Turnbull had two championship and two FA Cup winning medals. Sandy Turnbull left Manchester United on the outbreak of the First World War. He had scored 90 goals in 220 games. In 1915 he joined the Footballer's Battalion and was killed at Arras while fighting on the Western Front on 3rd May 1917. Whilst 'Sandy' Turnbull's colourful career was closely associated with the Manchester district, it could easily have been a different story. In the summer of 1902 he had agreed terms with Bolton Wanderers. In the interval between the arrival of the necessary papers, he received a better offer from Manchester City and went back on his promise to the Wanderers. A native of Hurlford, a colliery village on the outskirts of Kilmarnock, Turnbull was a coiled spring of a striker who cleverly conserved his energy for when it was most required. His quiet, deliberate methods often strangely contrasted with the helter-skelter tactics of the other forwards. He was also one of the most accurate headers of a ball, and 'nodded in' countless crosses from Billy Meredith - a prolific partnership that continued right through his career, During his time with Manchester City he won a Second Division championship medal in 1903 and an FA Cup winners' medal in 1904 before becoming one of a number of City players banned by the F.A. over an illegal payments scandal in 1906. "'Well, something will have to be done,' said Sandy Turnbull as he took a picture off the wall and walked out of the office with it under his arm. The rest of the boys followed suit, and looking-glasses, hairbrushes and several other things were for sale a few minutes later at a little hostelry at the corner of the ground. I stayed behind a while with the office boy who was in a terrible state over the players taking things away and he was most anxious to get them back before the manager arrived. 'Come along with me and I will get them for you,' I said. `It's only one of their little jokes.' I soon recovered the lost property for him. But it was funny to see those players walking off the ground with pictures, etc. under their arms."